Confession time… Until last week, I had never been to Universal Studios. I had been to Walt Disney World (several times) and SeaWorld (a couple of times), but never Universal. It’s not that I wasn’t interested. Seriously, I am a movie geek. I love a good movie and Universal is all about making movies come alive. Springfield USA (The Simpsons), Jurassic Park, Transformers and, of course, Harry Potter. 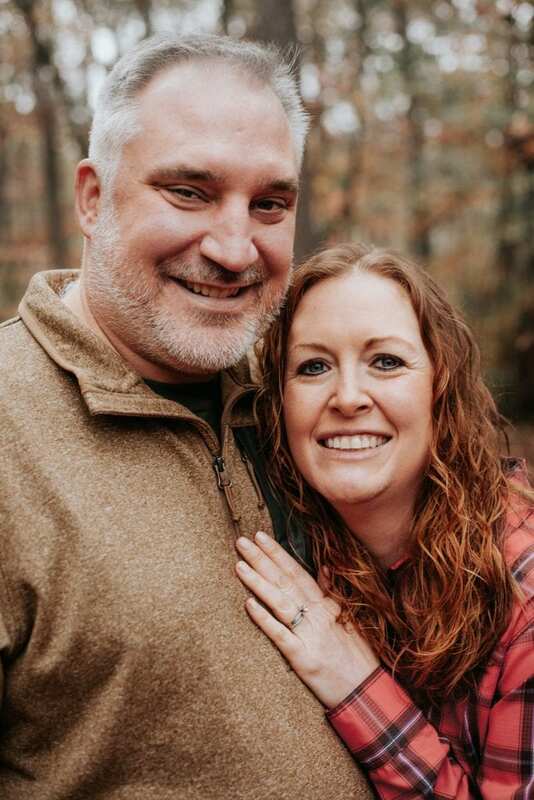 What more could I ask for, right? Well, a bit it turns out. 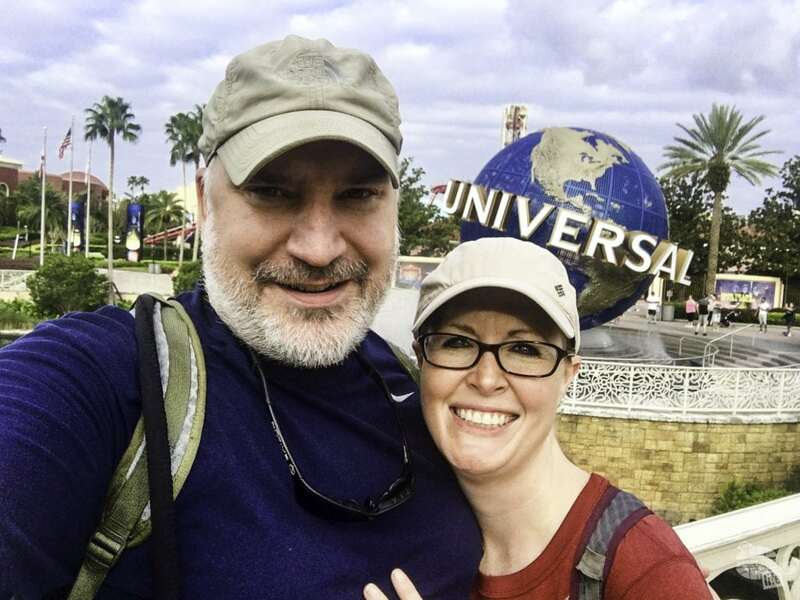 While I really enjoyed visiting Universal, there were several missteps in the parks. 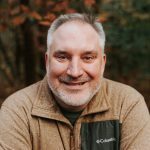 We visited in mid-September, a week after Hurricane Irma’s jaunt through Florida. While we did not see any apparent damage to the parks themselves, we could tell the trees had seen better days. The crowds were very light at Universal. 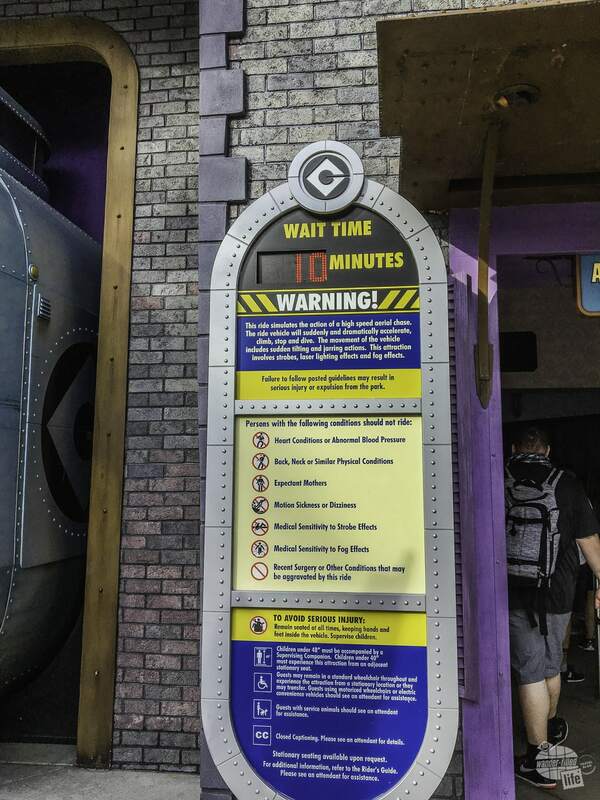 So light, in fact, that most wait times were 10-15 minutes, at most. Our longest wait time was only about 45 minutes. Because of the light crowds, we were able to move through the parks fairly quickly without any kind of fast pass (line-skipping) or early entry. 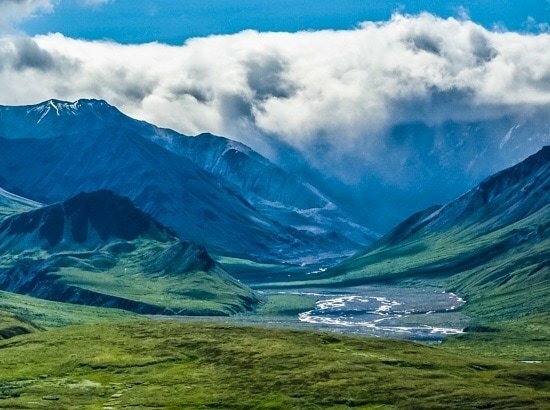 If you are visiting at a high-traffic time of year, expect a much different experience. Pro Tip: Download the app and check the wait times the day before your visit. That will let you know what to expect and which rides to jump on when the lines are short. Like most theme parks, Universal Studios is divided into several zones. Using the Universal app, we were able to keep an eye on wait times the day before we visited. This helped us make our decisions on which rides to prioritize when we were there. The opening view walking into Universal Studios. We started with Despicable Me Minion Mayhem, part of the Production Central area just inside the park. It’s an entertaining 3D motion simulator with some additional effects (mist, wind). It was fun. Neither of us had seen the movie inspiration, but we easily caught the gist from the entertainment while in line. Grant about to hitch a ride on the Night Bus. Unfortunately, that’s not a ride. Next, we headed to Diagon Alley, part of the Wizarding World of Harry Potter. It’s great! Seriously, it is. More on that and Hogsmeade below. 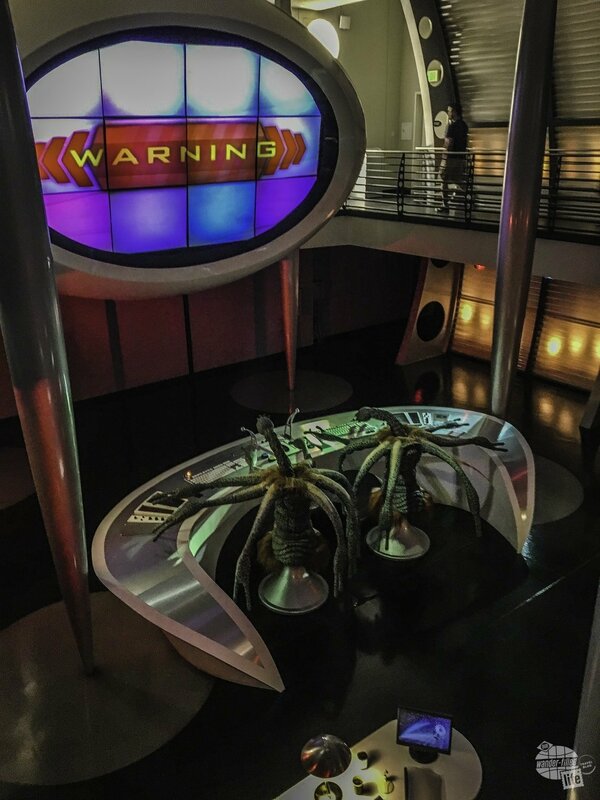 The queue area for the Men In Black ride features the control room from the movie. Men In Black Alien Attack is a shooting ride where you compete against the person sitting next to you. It was fun and was certainly unique among Universal rides. After a brief stop to shoot aliens, we headed for America’s town: Springfield. Springfield USA was outstanding for any Simpsons fan. There were plenty of Simpsons-related buildings, including Moe’s Tavern and Duff Gardens. The Simpsons Ride, while another motion simulator, is fantastic. 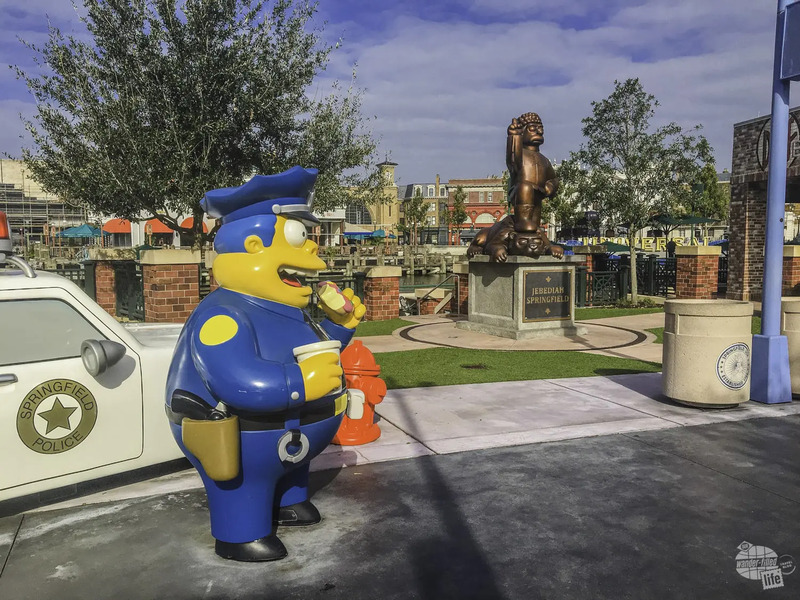 Chief Wiggum and the statue of Jebediah Springfield in Springfield USA. We also had lunch in Springfield, opting for tacos from the Bumblebee Man’s Taco Truck and a tasty Duff Beer. The fictional beer is actually made by a Florida craft brewery and is pretty good, though the Dufftoberfest was outstanding! 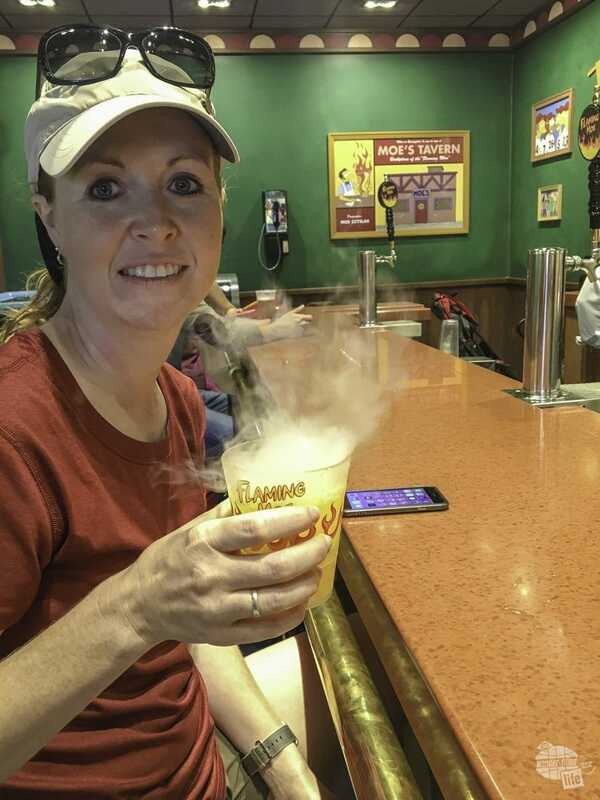 Bonnie got a Flaming Moe at Moe’s Tavern. Yes, we got a Flaming Moe from Moe’s Tavern, but it is non-alcoholic. It’s basically an orange soda with a dry ice pellet in the bottom to produce the smoke. It was just ok, but the novelty was worth it. The rest of the park was a bit lackluster. We rode E.T. Adventure for nostalgia’s sake. It needs serious updating. Admittedly, though, it is located in the kid’s section, so two adults are not really the target audience. Revenge of the Mummy was a lot of fun but needs some updating on its graphics. The Race Through New York starring Jimmy Fallon and Transformers: The Ride are both 3D simulators. While they are fun, by the end of the day, we were tired of 3D simulators. It felt like we were riding the same ride over and over again. Additionally, the queue system for the Race Through New York is convoluted and awkward. Basically, it was a lobby with couches and TVs scattered about showing clips from the Tonight Show. We were given a color-coded ticket and waited until our color was called. It was crowded, felt disorganized and we weren’t always sure what was going on. 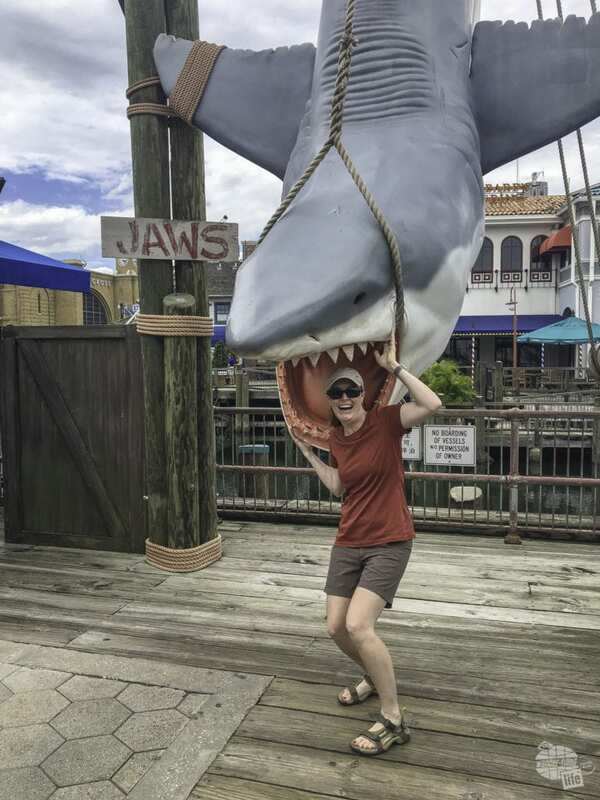 The Jaws ride is gone, but its legend lives on. Our final ride of the day was the only outdoor coaster: the Hollywood Rip Ride Rockit. A word of warning: make sure you don’t have anything in your pocket before getting in the line. If you don’t empty your pockets of EVERYTHING, they will send you back to get everything out. The roller coaster was really good, except for one grumble: the seat did not really hold your head in place. I am not a fan of my head banging all around in a rollercoaster. Bonnie was not a fan, however. Apparently, she is getting to the point where “heavy duty” roller coasters just aren’t her thing. The wait times were really short when we were there. According to a friend, who is a Universal-enthusiast, the crowds were much lighter than normal, even for September. We arrived around 9:00 a.m., were easily able to ride everything we wanted to and catch our shuttle back to the resort at 5 p.m. If it were more crowded, it might have taken longer, but I doubt a full day. To say I enjoyed Islands of Adventure immensely more than Universal Studios is an understatement. It was considerably better all around. Heading into Islands of Adventure. Our first stop was Skull Island: Reign of Kong. This was my favorite ride at the park. Seriously, I could ride this ride several more times to see all of the details. Basically, you are on a jungle expedition in the back of a cargo truck. The truck could have easily have been one of the trucks from the Kilimanjaro Safaris from Disney’s Animal Kingdom. 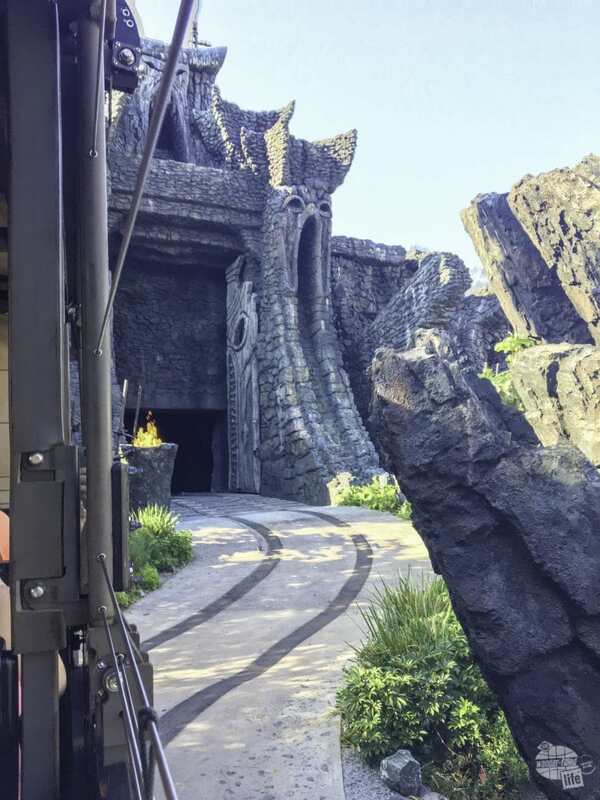 The start of the Reign of Kong ride. The ride itself immersed the truck in an adventure, with different events happening on both sides of the truck. Even with the short lines throughout the park, it was one of only two rides we elected to ride a second time. 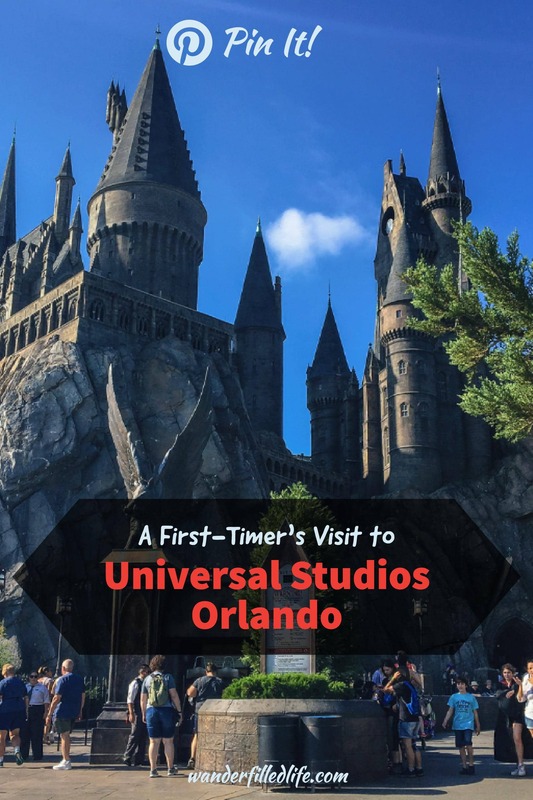 With an eye on wait times, we headed to Hogsmeade to visit the other half of the Wizarding World of Harry Potter… See below. Between the King Kong ride and Hogsmeade is one of the more interesting areas of the park: Jurassic Park. 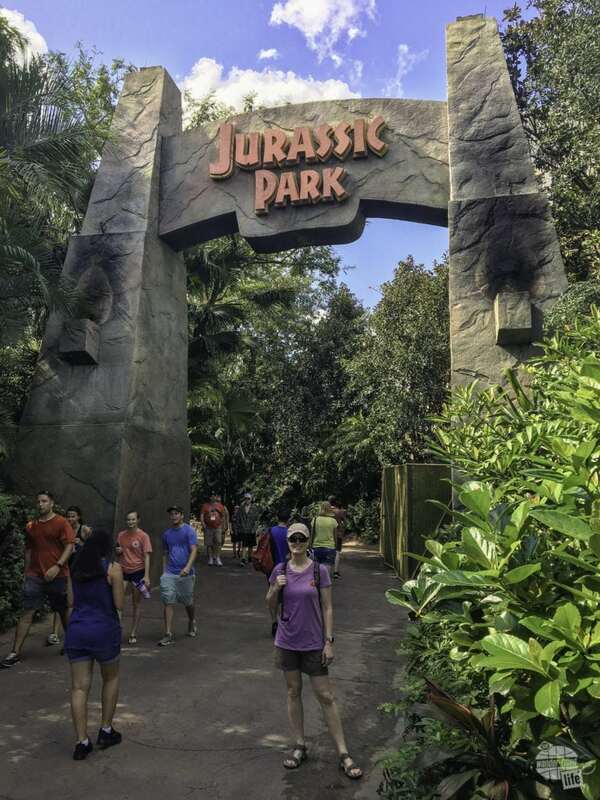 Home to the Discovery Center (a kid-oriented visitor center), a kids-only pteranodon ride and playground and the Jurassic Park River Adventure. The river adventure is a fairly typical boat ride with a splash plunge at the end. The ride is nearly 20 years old and the animatronics are showing their age. It was fun but needs updating. 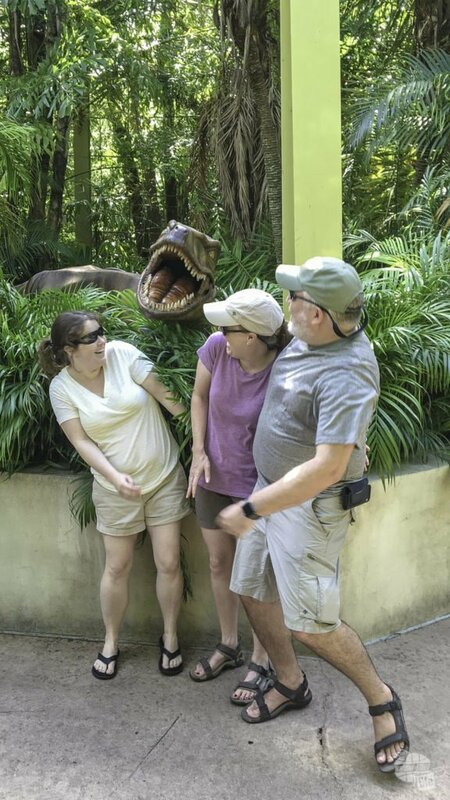 The Velociraptor Encounter proved… startling. There is also the Velociraptor Encounter, where folks get to pose with a velociraptor. The cast members are really great and make a point to make the velociraptor come alive. It was easily the most fun I have ever had “meeting” a character. The one missed note at Jurassic Park was the lack of other animatronic dinosaurs. There was a completely missed opportunity to have a Tyrannosaur or Spinosaur in the trees, poking its head out every now and then and roaring. After lunch at Thunder Falls Terrace (mmm… Turkey Leg! ), we decided to cool off on Dudley Do-Right’s Ripsaw Falls. A log ride in dire need of an update, it nevertheless soaked us to our bones. It was a great ride for a hot afternoon. 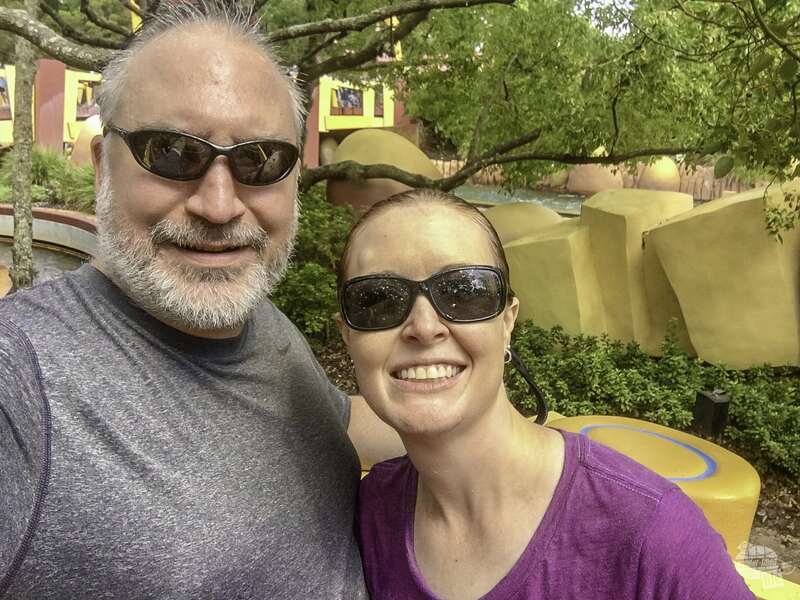 Ripsaw Falls completely soaked us. Quite refreshing on a hot day! The remaining adult rides are found in Marvel Super Hero Island. Eschewing the updates found in the recent Marvel movies (mostly due to licensing issues, I’m sure), the area is solidly decorated straight out of the comics and the 90s cartoon versions of the characters. The rides, however, are pretty solid. The Amazing Adventures of Spider-Man is more or less the exact same ride as Transformers, even down to the vehicle you ride in. If you have ridden one, you have ridden them both. Personally, I prefer the Transformers ride… It is a lot more up-to-date, graphics-wise. Doctor Doom’s Fearfall is a vertical launch and drop ride. It is quite fun, but Bonnie chickened out of riding it. She is just not a fan of drop rides, for the most part. The Incredible Hulk Coaster had plenty of twists and turns! 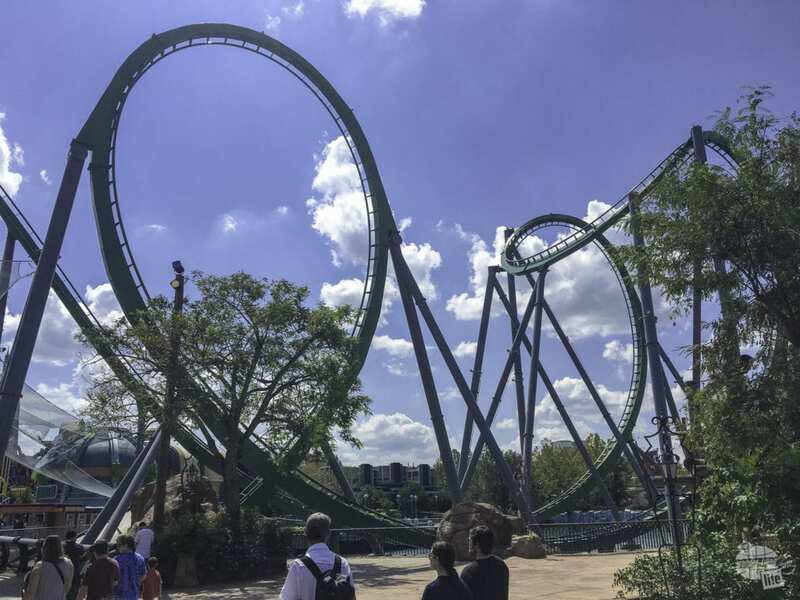 Finally, the Incredible Hulk Coaster offers an outstanding ride. Turns, twists and speed, the coaster has it all… and the head support is spot on to prevent wanging your head. It is every bit as good as any coaster in all of Disney World or SeaWorld. I am a huge fan of Harry Potter and I own all the books and movies. I was really excited to visit the Wizarding World of Harry Potter. A place I could get butterbeer and firewhisky? Hogwarts come alive? I’m in! First, let me say walking into Diagon Alley was breathtaking. I have been looking forward to visiting for years and this place was truly magical. The attention to detail in the entire area so impressed me. It felt so real. Knockturn Alley, Weasley’s Wizarding Wheezes and the Leaky Cauldron were spot on. 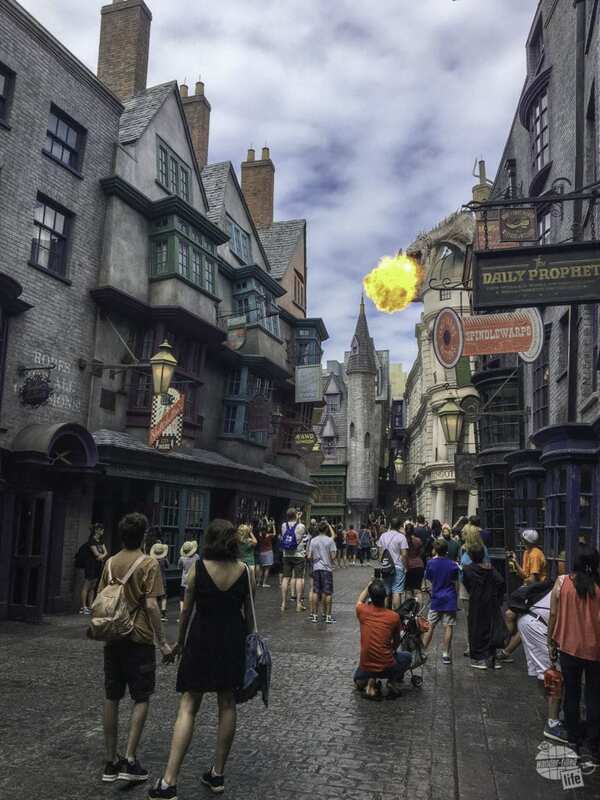 The dragon will breathe fire from time to time in Diagon Alley. The ride, Harry Potter and the Escape from Gringotts, was a lot of fun. It’s a roller coaster with 3D projections. It helps to have seen the movie to understand what was going on, but even Bonnie, a muggle, enjoyed the ride. The other “ride” in Diagon Alley is the Hogwarts Express. It’s basically a train which transfers you from Universal Studios to Islands of Adventure, but it feels like a ride to Hogwarts, complete with neat effects and a different story each way. The Hogwarts Express connects the two parks and provides a different experience based on the direction you ride it. My grumble? 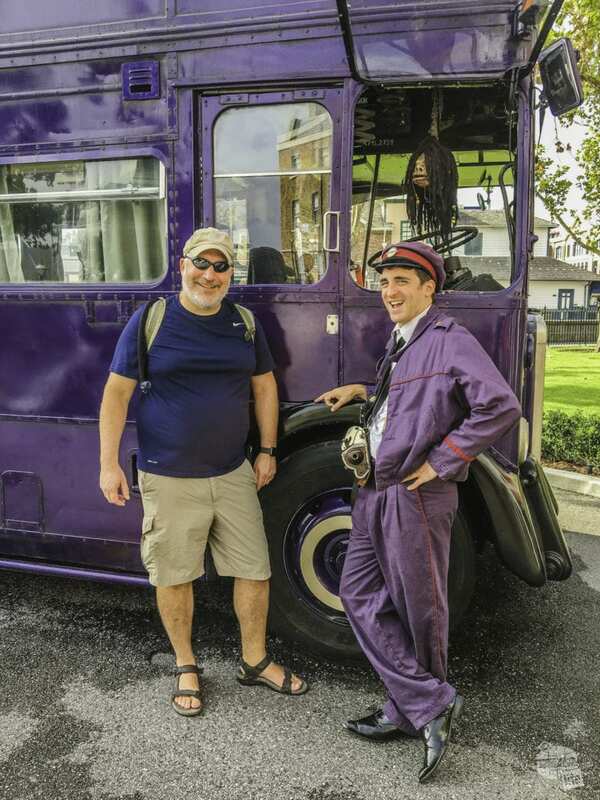 You have to pay for a park-to-park pass in order to ride the Hogwarts Express. It costs $55 to upgrade to a park-to-park pass. Honestly, based upon the closing times at the park (7 p.m. in September), I don’t see the value in a park-to-park pass unless you have been many times and only want to ride a handful of rides. So, it is a $55 charge to ride the Hogwarts Express. 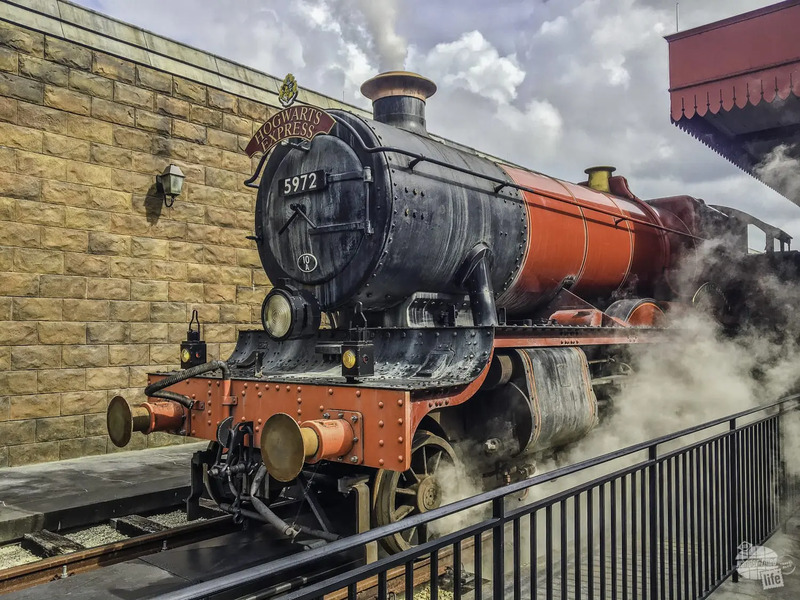 That said, if you were mainly interested in seeing just the Wizarding World of Harry Potter, getting a single day ticket with a park-to-park pass would allow you to experience everything Harry Potter and ride the Hogwarts Express. While not as robust as Diagon Alley, Hogsmeade is every bit as detailed and lovely as Diagon Alley. The Hogshead Pub was outstanding and all of the shops felt exactly as they should, with plenty of interactive surprises. 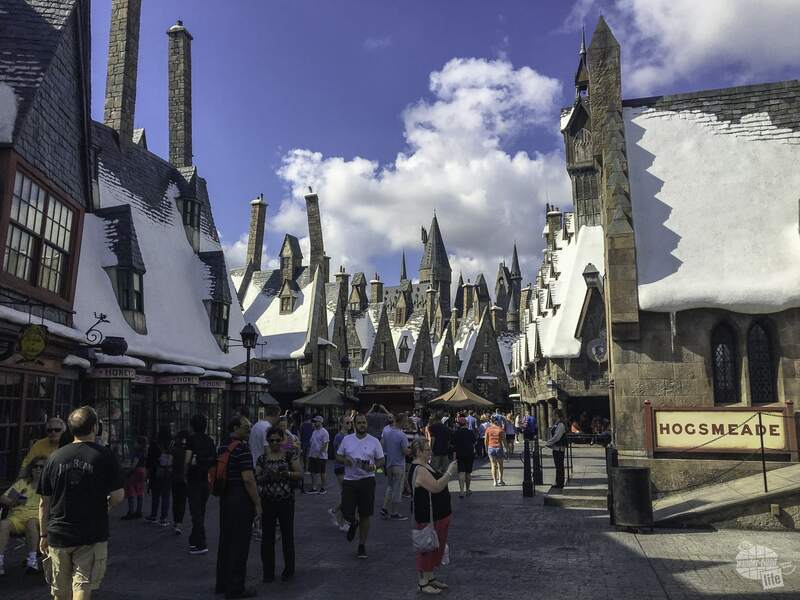 Like Diagon Alley, Hogsmeade is breathtakingly scenic. There are two rides in Hogsmeade: the kid-friendly Flight of the Hippogriff and the outstanding Harry Potter and the Forbidden Journey. Queuing through various parts of Hogwarts, I completely geeked out on all of the references. I was with Bonnie and her sister, both muggles, so they didn’t have the same excitement I did. The ride itself takes you through various parts of Hogwarts and is one the best balances of motion simulation and animatronics I have ever seen. In fact, it is probably the most unique ride we’ve ever ridden at any theme park. We rode twice and had a blast both times. Bonnie, the non-fan, was actually most interested in riding a second time. It was that good. 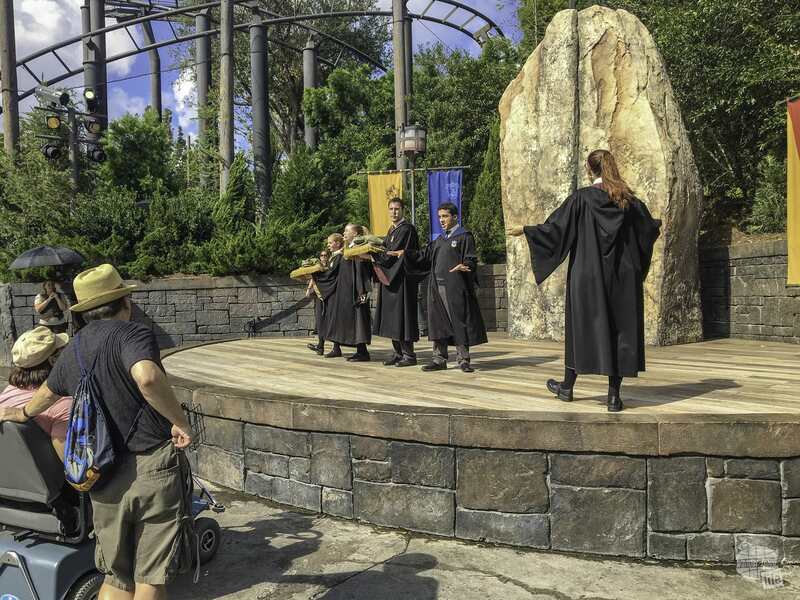 Both Hogsmeade and Diagon Alley feature stages for Harry Potter-related shows. The Dragon Challenge coaster was permanently shut down just before we arrived to make room for another Harry Potter ride. Bummer… We always love a good roller coaster. Forgive the comparison, but Disney World is my reference for theme parks. 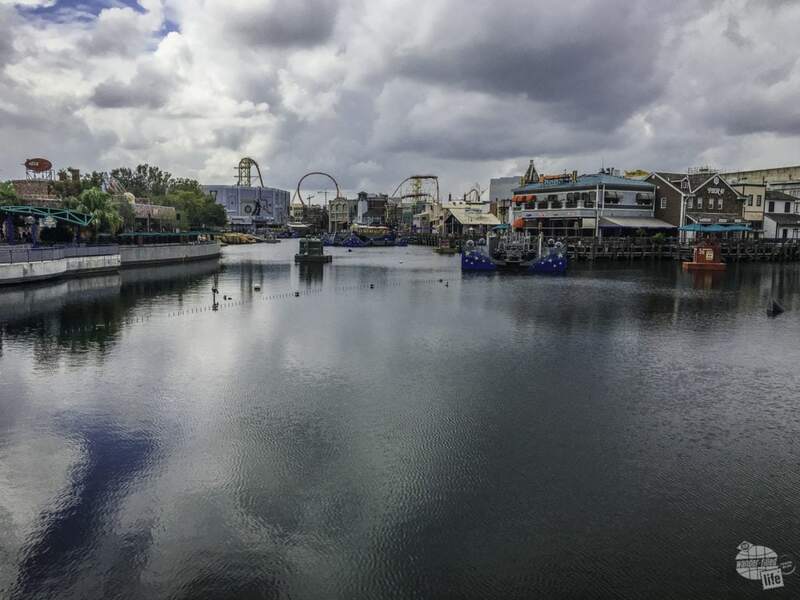 Both Universal parks are smaller and easier to do together. The two parks are right next to each other and are a walk or Hogwarts train ride from park to park. Universal City Walk is also right there. Grant enjoying a Key Lime Pie milkshake from Toothsome Chocolate Factory just outside of Islands of Adventure. Disney has larger parks, which encourage multiple visits. 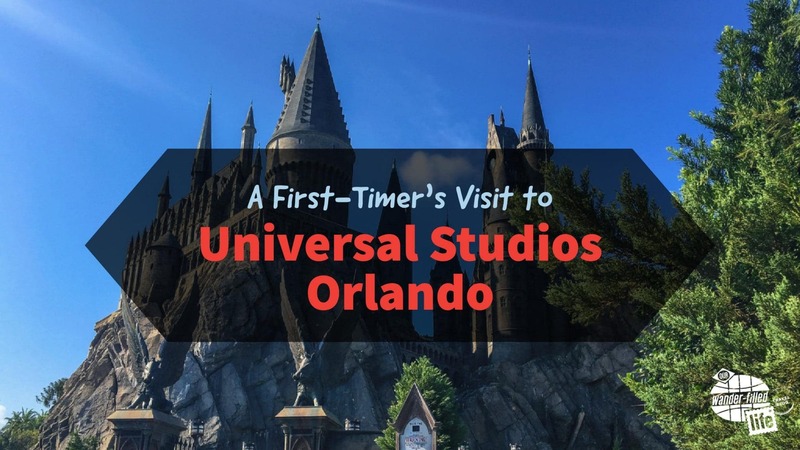 Universal parks can be visited in a single day each. You can’t ride everything in the Magic Kingdom in one day. It’s not possible. Disney does have excellent public transportation from park to park, but Universal’s compact size makes it a lot easier to get from place to place. In terms of rides, I feel Universal relies too much on 3D motion simulator rides. Disney uses animatronics far more extensively and does it better. That said, Disney is solidly geared towards children with an undercurrent for adults. Universal has kid-oriented areas but is more decidedly geared towards older children and adults. Universal’s Express Pass system (like Disney FastPasses) allows the rider to skip the lines, but costs at least $50 per person, per day, depending on several factors. That can add up quickly. That said, staying at one of four of the resorts at Universal grant unlimited express passes as a perk for guests. Disney’s FastPass system is free, but you only get three per day to start. One area Universal excels at compared to Disney is security checks. It takes far less time to simply use the x-ray device than have a security officer personally inspect your bag. Universal Studios is a lot of fun and the parks do a lot of things right. While they are geared towards kids, like all theme parks, they have plenty for adults, like a tasty glass of Duff Beer. One thing I really liked was the baggage storage lockers. On rides which do not allow bags or other items, Universal offers free (for a short period of time) baggage lockers. The free time is based on the wait time for that ride. The longer the wait, the longer the free rental period. 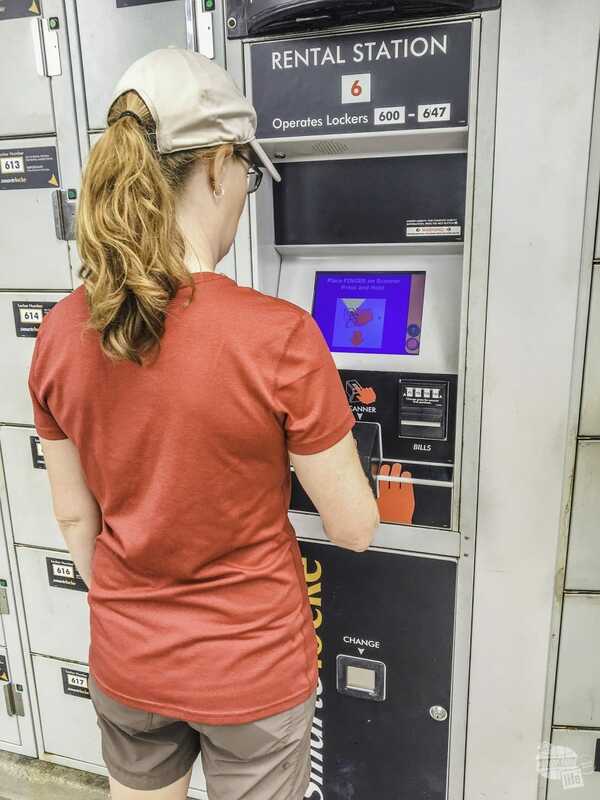 Bonnie using the free for a time lockers at Universal Studios. 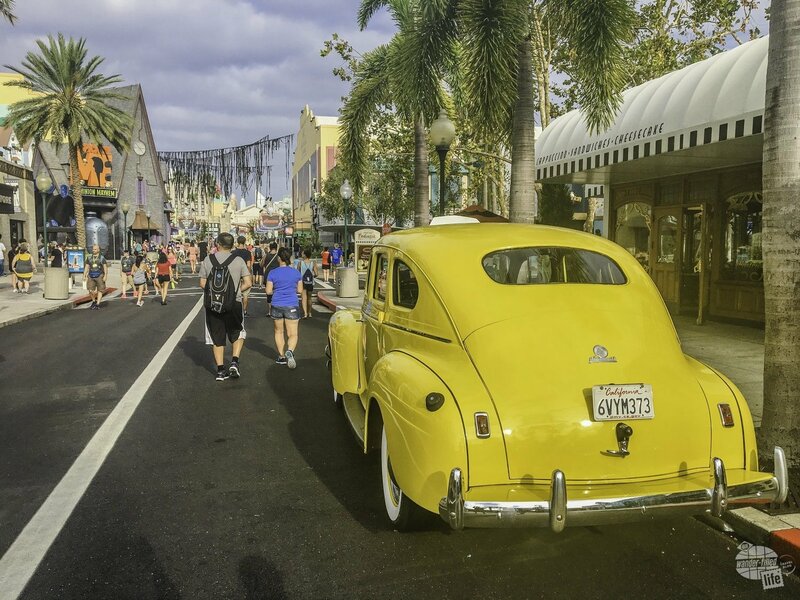 Outside of the two parks is the Universal City Walk, which is an entertainment and shopping area like Disney Springs, including one outstanding place to get milkshakes, Toothsome’s Chocolate Emporium. 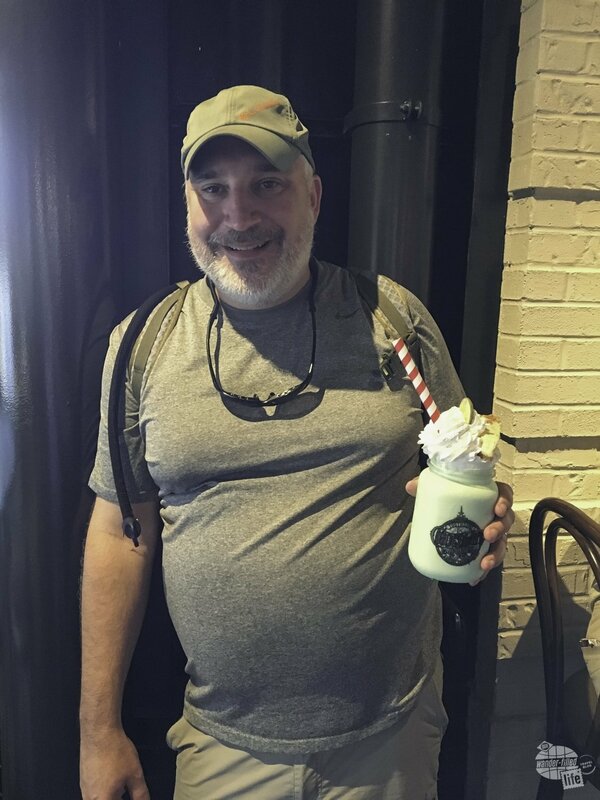 Several folks mentioned that we had to try a milkshake, so we did! 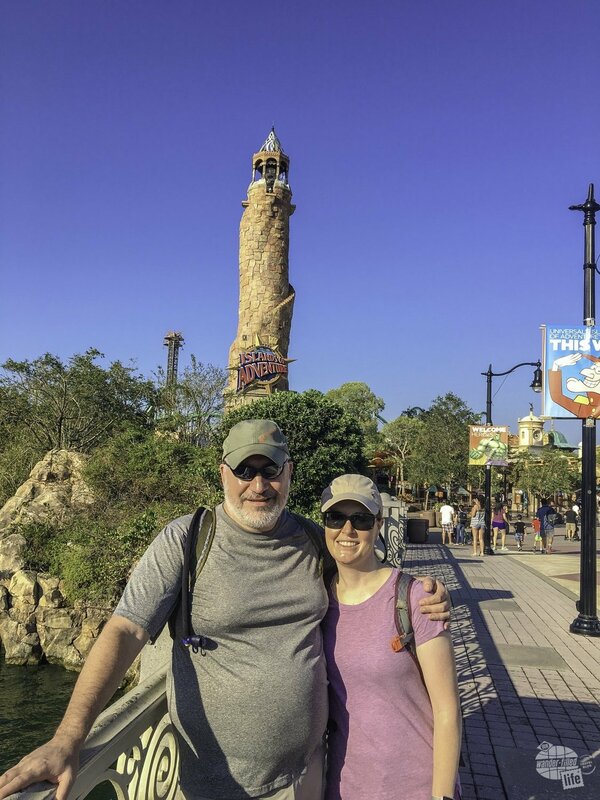 I really enjoyed my time at Universal, but if I were to visit again, I would probably only purchase a one-day pass with the park-to-park option rather than spending more than one day. Especially in the offseason, the lines are not long enough to warrant two days to ride all of the “good” rides. Were it the busy season, I could see us staying at the Hard Rock Hotel for a couple of nights to take advantage of unlimited express passes to skip the lines.